​May the 31st saw the 2018 Essex Mark Provincial Grand Lodge take place, once again, at the picturesque setting of Felsted School. On what was a fine day on the inside if, as it transpired when we left, a little damp on the outside, around 350 Mark Masons from Essex and across the Country gathered together to attend the meeting and enjoy the festive board afterwards. 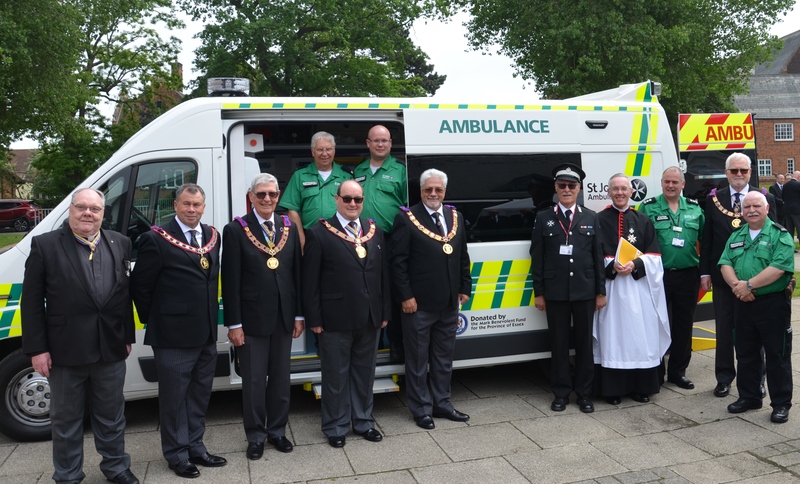 We were privileged to be able to see-and take a short tour round- the MBF Ambulance which was formally presented to St. Johns and blessed before the meeting. With Provincial Lodge opened, the Provincial Grand Master, R.W. Bro. Terence D. Sheern, formally welcomed our guests who numbered over 40 from other Provinces and Heads of other Essex Masonic Orders- a splendid attendance and a measure of the success of our Province. The PGM, went on to appoint and invest his officers as well as those receiving first appointments and promotions. His address is published below. Our own Regalia Store was, again, there, with a significant amount of pre-loved regalia sold to members not only saving them a significant amount but also raising a significant amount for the Essex Mark Welfare Fund.